The island of Grosse Ile, along with what is now Westcroft Gardens, was purchased July 6, 1776 by the brothers William and Alexander Macomb from the Pottawatomie Indians. The Pottawatomie had camped here to hunt, fish and gather wild fruits. Many Indian artifacts have been found in Westcroft. In 1811 the "treaty" between the Macomb brothers and the Pottawatomie Indians was finally ratified by President Madison and William's three sons were recognized as the owners of Grosse Ile. A photocopy of the deed, or "treaty" as such land transactions with the Indians were called, is in the Westcroft office. The original is in the Burton Collection of the Detroit Library. David Macomb owned the central part of Grosse Ile which included Westcroft but he got into debt and sold it to his cousin John Anthony Rucker II. The large white house on West River Road, north of the entrance to Westcroft, was built by J.A. Rucker II in 1835 (according to a paper found in the tax records after the historical society marker was made stating a date of 1848) but his wife did not want to live on "wild" Grosse Ile. J.A. Rucker's cousin, Robert Lee Stanton, purchased the farm and house in 1873, in order to bring his widowed Alexandrine Macomb Stanton, the daughter of General Alexander Macomb, back to Grosse Ile to live. Robert Lee Stanton (the godson of General Robert E. Lee) farmed Westcroft as a diversified farm but the main product was hay for the horses that pulled the Detroit trolleys. Henry Ford's invention of the automobile made hay for trolley horses obsolete. So Robert Lee Stanton's son, Ernest Newman Stanton, gradually changed Westcroft into a nursery specializing in the acid soil plants such as rhododendrons, azaleas, laurels, dogwood, etc. He started this soon after returning from World War I, changing treeless hay fields into 5 1/2 acres of landscaped botanical gardens. 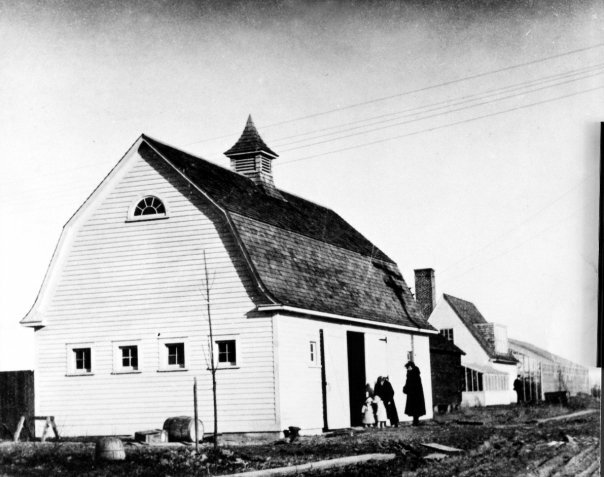 The white barn by the parking lot was built about 1925. Pictures of it and the first greenhouse in barren fields are in the office, and included below. Westcroft Gardens is currently owned by the 7th generation Macomb descendants and managed/operated by the 8th generation. We proudly continue the family farming history and maintain Ernest's botanical gardens still honoring his wish for it to be open to the public every single day of the year.